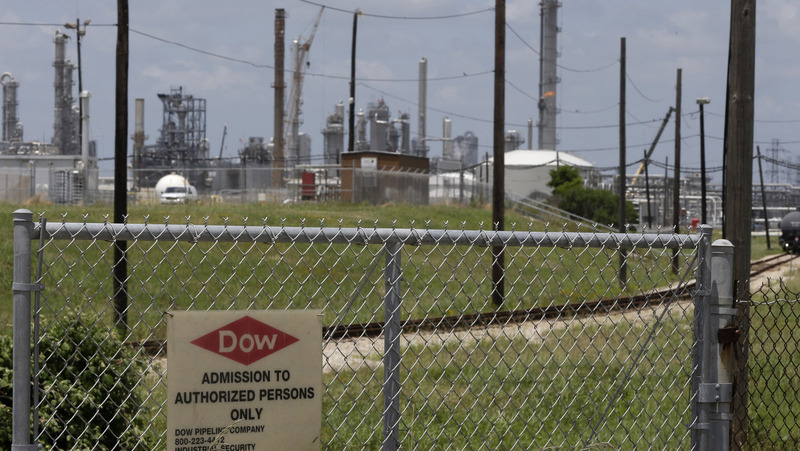 Will Texas GOP Candidate's Actions On Chemicals Prove Toxic? : It's All Politics After a big explosion last year, Texans are worried about what's in nearby chemical plants. Attorney General Greg Abbott, who's running for governor, isn't making it easier for them to find out. Will Texas GOP Candidate's Actions On Chemicals Prove Toxic? A sign posted on a roadside fence outside a Dow Chemicals plant in Freeport, Texas. The front-runner for governor, GOP Attorney General Greg Abbott, sparked controversy recently by suggesting citizens should simply go to nearby chemical and fertilizer plants and ask what's being stored there if they are worried about hazardous materials. Texas Republican Greg Abbott, who's been cruising toward easy victory in the governor's race against Democrat Wendy Davis, is making some campaign news this week — and not the good kind. His actions and comments have brought his relationship to the state's chemical industry under scrutiny. The trouble began with a report last month from Dallas-Fort Worth television station WFAA that revealed the state of Texas — at the direction of Attorney General Abbott — had quietly begun blocking access to reporters and the general public about just what chemicals were being handled and stored in the state's fertilizer and chemical plants. Under long-established federal law, the Community Right to Know Act, this information must be available to the public — and so it was in Texas, at the Department of State Health Services. The attorney general's office says it won't release the information because "it reveals the location, quantity and identity of hazardous chemicals likely to assist in the construction of an explosive weapon." Yet the question of just what is going on inside the state's chemical and fertilizer plants became a sensitive issue after a massive explosion in the city of West last year killed 15 people, including 12 firefighters and first responders, injured 160 more and caused millions of dollars in damage to the surrounding neighborhoods. The fertilizer plant had been there for 50 years — and nobody in the little Czech farming town gave it much of a thought. Until it blew up. The federal investigation concluded that the brave volunteer firefighters had no idea what they were up against — 540,000 pounds of ammonium nitrate and 110,000 pounds of anhydrous ammonia were stored in the West fertilizer plant. Survivors described seeing the shock wave expand toward them like a nuclear blast. The fact that their fertilizer plant stored hundreds of thousands of pounds of hazardous chemicals was quite the revelation to the citizens of West. And it caused reporters and citizens across the state to suddenly ask themselves, "I wonder what's going on in that fertilizer plant down the street?" Which is why Abbott's ruling caused some statewide consternation. When the GOP candidate for governor was asked by a reporter on Tuesday what the citizens of Texas should now do if they want to find out what's being handled and stored at the chemical plant near their house or where their children go to school, Abbott suggested that Texans get in their cars and start driving. "You can ask every facility whether or not they have chemicals or not," Abbott explained. "You can ask them if they do and they can tell you, 'Well, we do have chemicals,' or 'We don't have chemicals,' and then if they do, they'll tell which ones they have." But Abbott's happy fantasy was quickly disproved by reporters who did exactly as the attorney general instructed. When they walked up to a facility's front doors and asked for a list of what chemicals were handled and stored at the plant, they were not asked to take a seat while that information was promptly assembled. They were told to turn off their cameras and leave the property immediately. Empty handed, of course. Which seemed to surprise no one outside the AG's office. On Wednesday, the Dallas Morning News reported on a possible explanation about why the Texas attorney general is suppressing information about the state's fertilizer and chemical plants: He's been the recipient of major contributions from the industrialist Koch brothers and major chemical companies. Abbott has received more than $75,000 from Koch interests, including $25,000 from Chase Koch, son of Charles Koch (who also chipped in $25,000). Another $50,000 in contributions came from Chevron, DuPont and Dow Chemical and other chemical companies. The paper also described how Abbott flew on the Koch company jet to an invitation-only gathering of GOP politicians last year to meet with wealthy donors at a New Mexico resort. The spectacle of a Texas governor — or would-be Texas governor — cozying up to the chemical, oil and gas industries isn't exactly news. But with the tragic fate of the West volunteer firefighters still fresh in the minds of many, Abbott's reminder to Texans of their relative powerlessness wouldn't seem to be the best campaign strategy. Even for a candidate 12 percentage points ahead in the polls.